Nehemiah’s campaign to rebuild the walls of Jerusalem is a fascinating account of effective leadership in the face of great adversity. More importantly, it’s an outstanding lesson on the power of prayer combined with a willingness to work toward a God-given goal. As a high-court official for Persian King Artaxerxes I, Nehemiah was accustomed to a certain level of influence that came with his position. But upon learning that Jerusalem was in ruins and the survivors were in distress (Nehemiah 1:1-3), it’s remarkable that he did not immediately beseech the king for help. No, the first thing Nehemiah did was pray! Prayer plays a significant role in Nehemiah’s account. He prayed before making his request to the king (2:4) and then again as his enemies angrily mocked the people’s building efforts (4:4). But “the people had a mind to work” and were committed to the cause, and under Nehemiah’s capable management the “entire wall was joined together up to half its height” (4:6). Even as their adversaries conspired against them and the threat of attack seemed imminent, Nehemiah and his wall-builders made their prayer to God and kept on working (4:9). Prayer is a powerful weapon, but it can be ineffective without appropriate action. After Nehemiah’s prayer, he was quick to set a watch against their enemies “with their swords, their spears, and their bows” (4:13). The people were ready “to fight for [their] brethren” if necessary (4:14), but at the same time they were confident, proclaiming that “our God will fight for us” (4:20). Rather than relying simply on prayer and hoping for divine intervention, God expects us to use whatever means we have to meet the ministry need at hand. This is a sound biblical principle that we may fail to remember at times. Rather than relying simply on prayer and hoping for divine intervention, God expects us to use whatever means we have to meet the ministry need at hand. Consider the Lord Jesus’ rebuke of those who asked Him to perform a miracle to test Him or merely to see something curious: “Unless you people see signs and wonders, you will by no means believe” (John 4:48). Nor does He condone prayer in lieu of obedience. As Joshua was praying for deliverance from the enemy, “the LORD said to Joshua: ‘Get up! Why do you lie thus on your face? Israel has sinned, and they have also transgressed my covenant which I commanded them’” (Joshua 7:10-11). The same applies to prayer in lieu of effort, for “faith by itself, if it does not have works, is dead” (James 2:17). God provides even for the birds of the air—but He still expects them to scratch for the worm (Matthew 6:26)! Just as Nehemiah was called by God some 2,500 years ago to complete a significant project, God has called ICR to do an important work here in the 21st century. 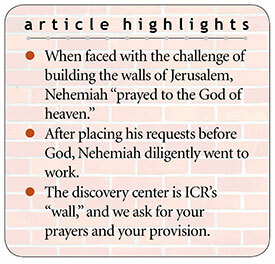 The ICR Discovery Center for Science and Earth History is ICR’s “wall,” and like Nehemiah, it is a project that requires much prayer and many hands. The ICR staff meets together every work day to pray, asking the Lord for His wisdom and guidance as we work through each detail. We also ask for His special financial provision—and He has been faithful to supply so much! But our wall is only half built, and we need help from God’s people with “a mind to work.” Will you claim a portion of our “wall” as your own? Please give generously to the ICR Discovery Center. But above all, pray! Cite this article: Henry M. Morris IV. 2018. Prayers, Walls, and a Mind to Work. Acts & Facts. 47 (4).